Several faults did from my side and I was detected and corrected online all the issues. I was not very familiar with the technical details, so faced several problems. That was the tough day for me. Continuously siting raised pain in my hand and shoulders. Let's forget all these things and discuss the main issues. 16 Another Way To Earn Money Online After AdSense Disapproval. If a blogger or site owner get the message from Google team that your AdSense has been disapproved or Account has been disabled. Then it is bad news for them because he/she spend a long time to make a site and want to try some money from that. 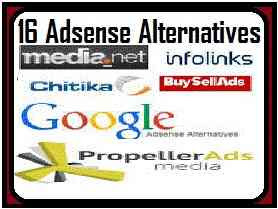 It is very important to know about the alternative way to earn money online without AdSense. You can use below given Ad Agency, which is best paying and work like Adsense for a site. These alternative are used to monetize your website without using Google Adsense. 1. Yllix Inc - This is working on the revenue share model. Meaning of this sentence is that if publisher earning is good, a company will also earn a decent amount. Completely based on the shared relationship. The company is providing automatic real-time optimization with a 100% worldwide fill rate. Work with CPM, CPC & CPA ad campaigns. The payment process is so simple for publishers. They pay on weekly basis. A publisher can get his payment on a daily basis with very small $1 payout minimum on request. Format available - Banner Ads, InApp Banner Ads, Redirect Ads, Slider Ads, PopUp, Layer and Direct Link Ads provide a company to a site owner. 2. Revenue Hits - They assure to earn money with minimum effort. This platform optimizes earning and convert your assets into the income property. Revenue Hits provide a varied format with the pricing model for publishers. The model is CPA, CPI, CPL, and CPM. Algorithms constantly improve performance according to your website content. They provide Ads format in a different size for mobile, tablet or desktop screen. Ad types for your site are available - Display Banners, Button, Footer, Interstitial, Pop Ads, Shadow Box, Slider, Top Banner, Dialog, and Notifier. 3. Adversal - This network manages your site ad space and offers a 100% fill rate. The good and very good thing is that they pay the highest CPM rate for your blog or site content. Multiple slandered formats are available with a 100% fill rate. You can withdraw your payment if your threshold will be reached at $20 minimum. The instrument used to transfer your earning money is PayPal, ACH, Check, or Wire. Basically, the approval process is tough for a new site. It will take time to scrutinize your site and can wait 30 days after submitting the application. A website should follow the rules and regulation of Adversal. The advantage is that they accept all website and pay for all of your visitors. Minimum withdrawal amount is $10 and you can withdraw on daily basis. Payment goes to you via Paypal, Paxum or Payza. 5. PopAds - This is unique Ads provider. Here is an option for you to set your minimum bid. You have the right to choose to serve popunders with auto-playing sound and video ads. The publisher can set frequency for a website as per his interest. They pay revenue for 1000 US unique visitors on your website, never below 4$ USD. Payment release on NET 30, NET 60. The acceptable account is PayPal or Alert-pay account. 6. Media.net - This the joint venture of Yahoo! Bing network. One of the best Ad agency. This is one of the largest marketplaces for keyword-targeted advertisers. Provide relevant ads for standard IAB. The format used - In-content ads, Mobile docked ads, Desktop interstitial ads. Best option to earn money online by Media.net. 7. PropellerAds - This platform gives approval easily and instantly you can start to earn money according to traffic on your site. They monetize your international traffic with revenue boosting ad units. They confirmed the 80% revenue share. This company founded in 2011 and run successfully to date. They are in the market with modern algorithms and use the latest technologies. They provide the highest CPM rate in the industry. 8. Chitika - This was the first ad agency I have opted for starting because my Adsense request could not be approved. Basically, this publishing platform good for your site when you receive decent traffic from the USA and Canada. 9. Infolinks - This is the largest monetization network in the world and very popular among publishers, whose AdSense has been disapproved. The very simple process of approval and have the best format for your site to display ads. Ads do not disturb your site content and irritate your visitors. They use those place on your site, which is blank. A simple process they adopted, just sign up free, then past code and start earning instantly by your present site traffic. Ad format they use are - InFold, InScreen, InText, InTag, InFrame, InArticle. 10. Viglink - They convert your keyword to earn money online by the snippet of code to your site. This house inserts new links on relevant phrases to capture purchase intent. Monetize your site and link your influential content into valuable marketing revenue for you. You have to place his code as per guideline. Provide dashboard to see the revenue generation details with EPC, clicks, sales, CTR, page-views etc. online. 11. Adsterra - Monetize easily with this publisher network and use smart technology for your blog. An easy going process to start earning by this platform. First register with Adsterra, place code on your site and start earning on your present site traffic. They guaranteed to monetize with 100% fill rates and competitive CPMs on safe ads. You will receive your payment on time with NET 15 hold policy. Ads format they provide are - Display banners, Leaderboard, Rectangle, Skyscraper, Popunders, Interstitials, Direct link, Video banners. 12. Adnow - This is the best Native Advertising platform to monetize your website with sell traffic and generate high income. Your website earns money by Adnow targeted recommendations from sponsored content. This platform function automatic promotion of your site content with native ads. They assured to boost your page views by 50%. Another best points for you that they have a 5% referral program with a $20 minimum weekly payment method. You can receive your payment through Paypal. 13. Globeads - This is an American based company. The company provides the best rates in CPM. This is a reliable and trustworthy ad network. They given declaration that they are providing an innovative interface, highest CPM with low payouts. Payment can receive through Paypal, Payoneer, Bitcoin. The site owner can receive the payment on a daily basis. 14. Hilltop Ads - Impressions based network help you to earn money. This is CPC, CPM & CPA based network and receives traffic from direct publisher only. Hilltop provides eCPM real-time optimization for your site. Work without any financial transaction fees. Ad format provides like - Mobile Banners, Display Banners, Mobile Popunder, In Player Ads, Instant Message, Popunders. Best technical support provider. 15. Clicksor - This is an old advertising agency and one of the best publishing houses for your site. They provide quality ads with diverse ad formats and you can get weekly payment via Paypal, Check, Payoneer. They provide dedicated technical support manager to assist you with any question. Its referral program helps you to get 10% additional income. Ad format use - Inline Text Link, Text Banners, Graphical Banner, Pop-Unders, Interstitial Ads. One thing is very clear on site that what they provide against your blog or site traffic. No hidden text is there, clearly mentioned and described everything there. 16. Yes Advertising - They provide a solution to web publishers. This chooses the monetization metrics are based on CPC, CPM, CPV, and CPI. As well as they provide 10% additional money by referral program. This agency paid weekly via check, Paypal, Payoneer, Wire. The good part is that you can use a 40+ ad format for your site. These are the selective alternative for you to earn money online without any delay if your AdSense disapproved or not approve by Google. Share this content with your colleagues.